The 2018 SOL pass rates provide some bad news for our neighborhood (and help explain why there’s a new principal at Westover Hills). 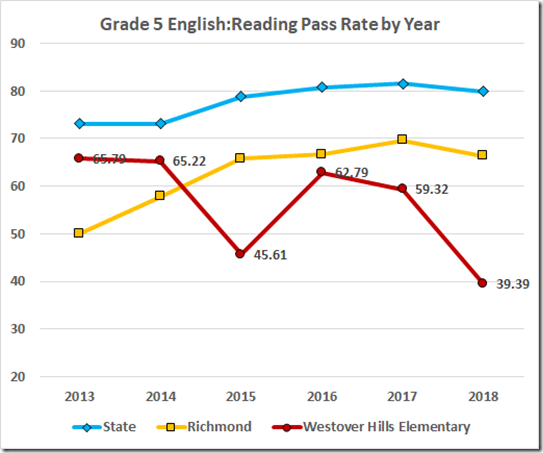 You know you’ve got reading problems when the best news is a 48.15% pass rate (in the fourth grade). 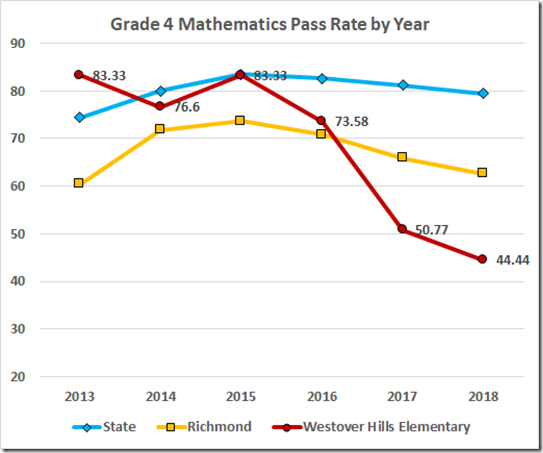 But the math pass rates are even worse. You read that correctly: 23.08% pass rate in 3d grade math, 21.21% in 5th grade. 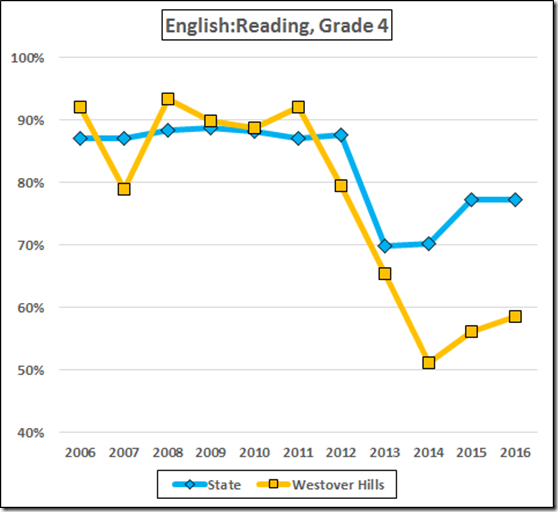 For reference: The accreditation benchmark for reading is 75; for math, 70. 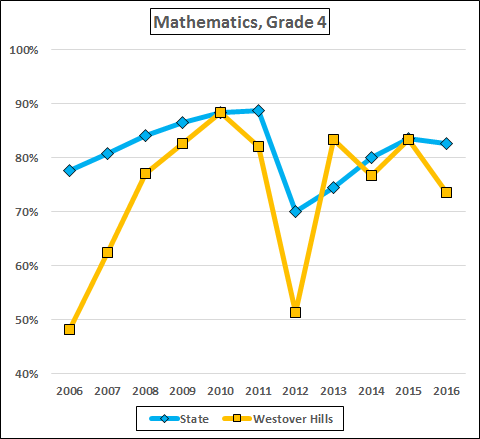 Having taken an overall look at Westover Hills’ slide into loss of accreditation, let’s turn to the details. 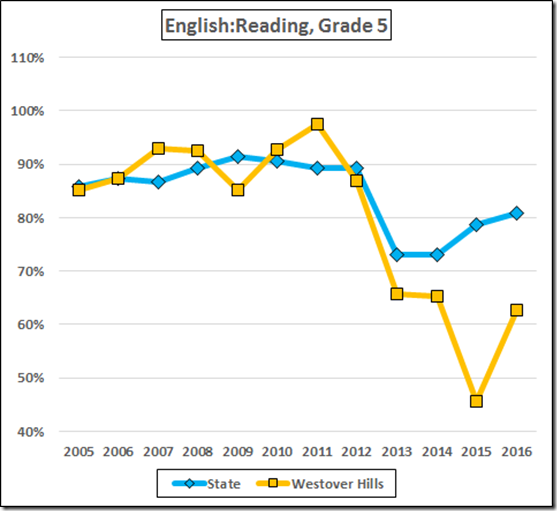 Recall that VBOE installed new math tests in 2012 and new English and science tests in 2013 that lowered pass rates statewide. 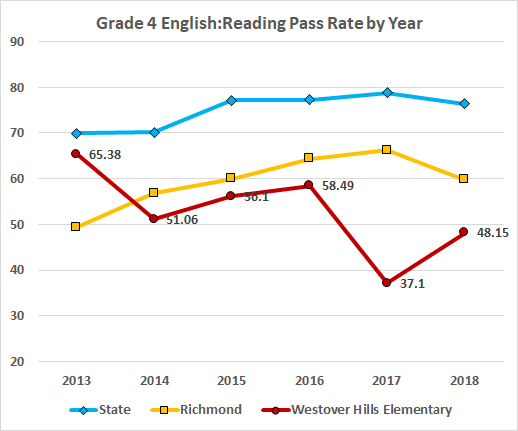 The drops were generally exaggerated in Richmond because our former Superintendent failed to align the curricula to the new tests. 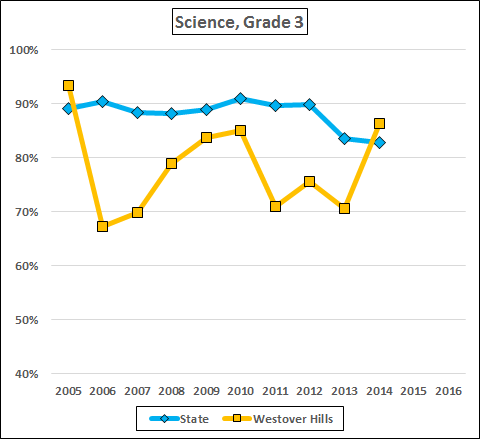 At Westover Hills, we see the exaggerated drops in reading and math, but not in science. 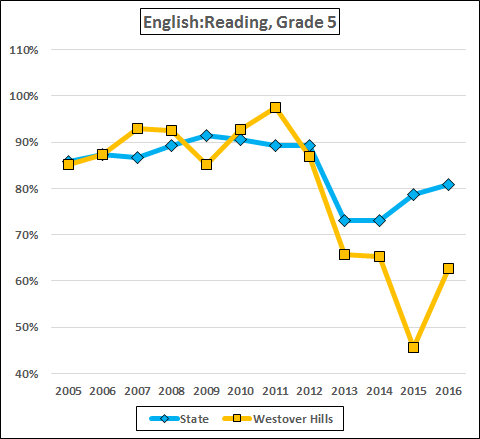 Then, in 2014, the third grade in Westover Hills enjoyed a renaissance. 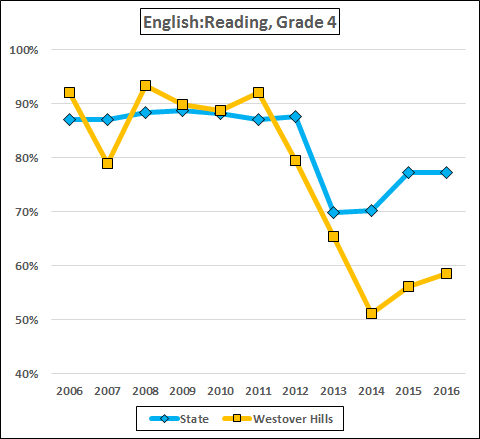 Unfortunately, that lasted only one year in reading and math; both fell in 2015 and yet again in 2016 while the state averages were improving. 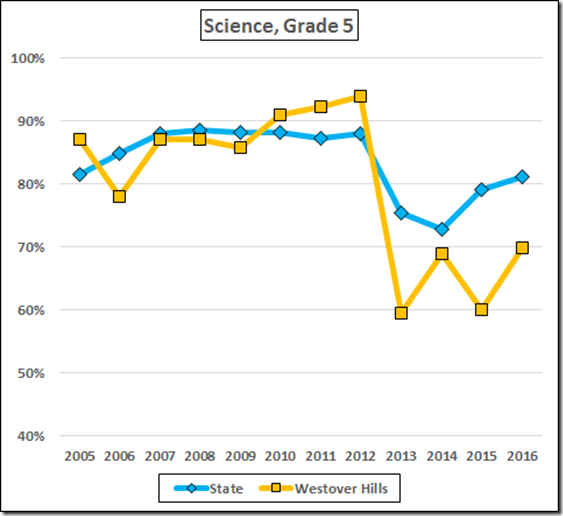 There’s no telling about science after 2014 because VBOE stopped testing in 2015. 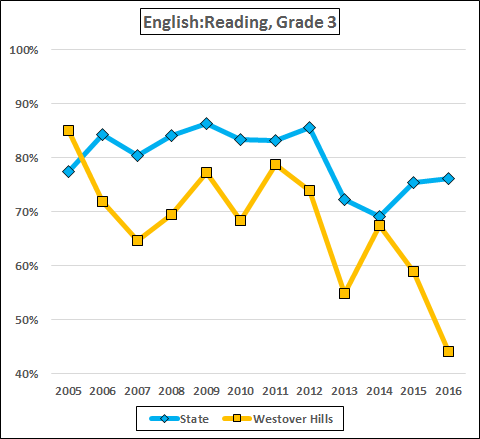 The fourth grade reading data show Westover Hills declining before the new tests in 2013, dropping in ‘13, and then dropping again in ‘14. 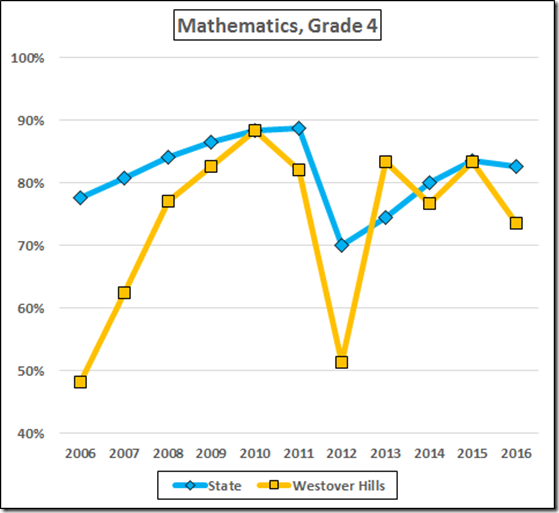 The fourth grade math tests look much better, showing performance near the state average after the drop in 2012. 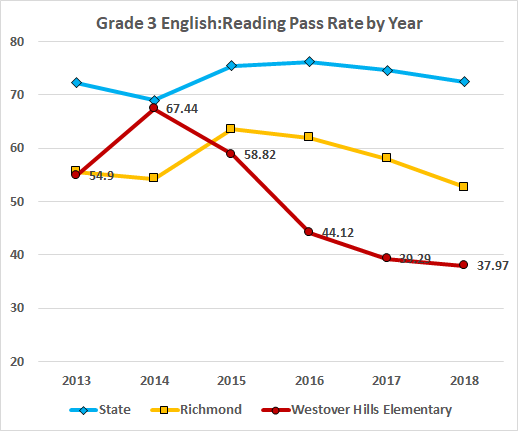 But the decline in ‘16 is worrisome. 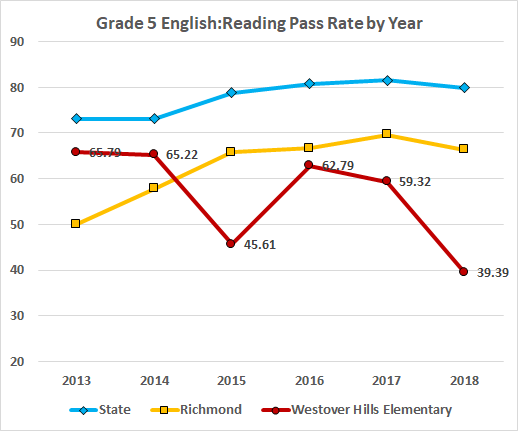 The fifth grade reading pass rates took the plunge from excellent to below the accreditation threshold in 2013. 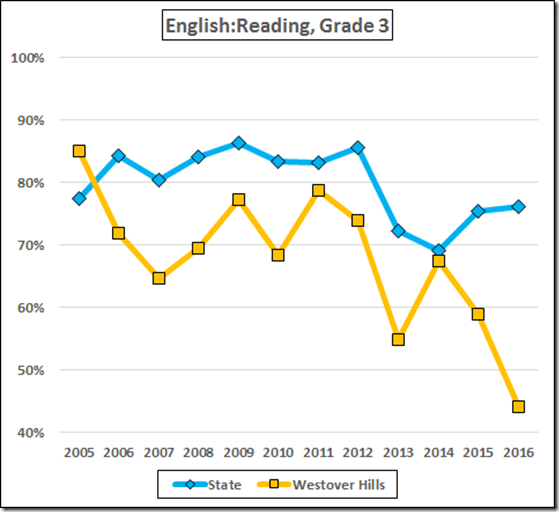 They failed to participate in the ensuing statewide improvement; that failure was exaggerated by a one-year drop in 2015. 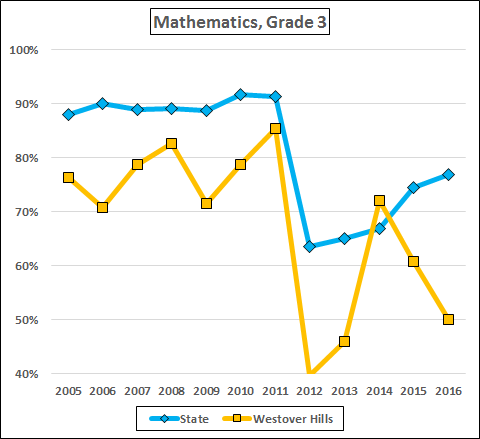 The math data nearly mirrored the third grade math performance, with a big jump in ‘14, followed by a steep decline. 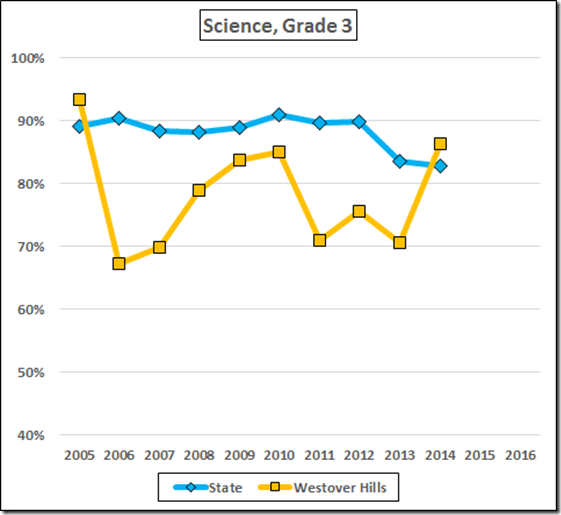 The science performance started above the state average before 2013 and then fell into denial of accreditation territory with the new tests in ‘13. 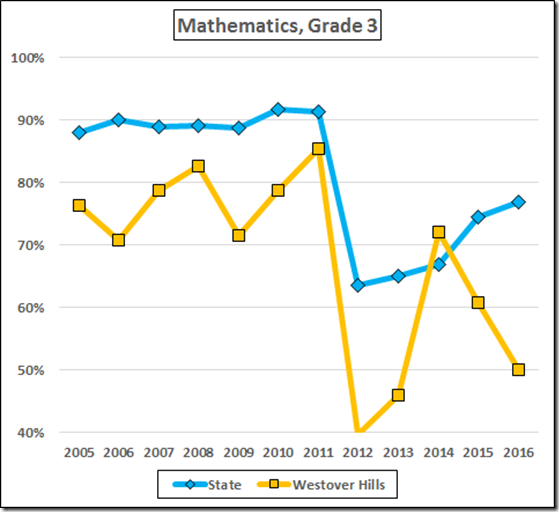 The third grade cohort that performed near or above the state average in 2014 in all three subjects delivered a poor showing in reading and a below average performance in math (albeit above the accreditation benchmark) in fourth grade the following year. 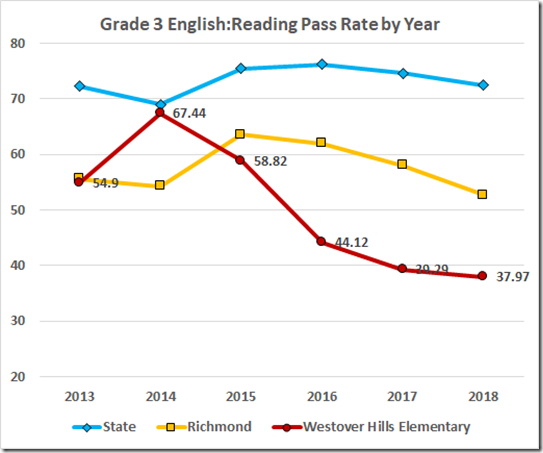 These kids did not go dumb over the summer; the difference had to be the teaching. 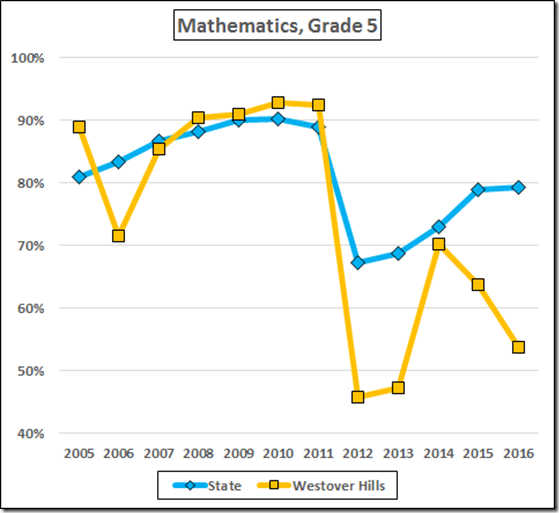 Indeed, the spikes in 2014 and the fourth grade math performance on the new tests and the generally good fifth grade pass rates before the new tests arrived all confound any suggestion that the problems here are the students. The problems, where they exist, surely are the teaching. 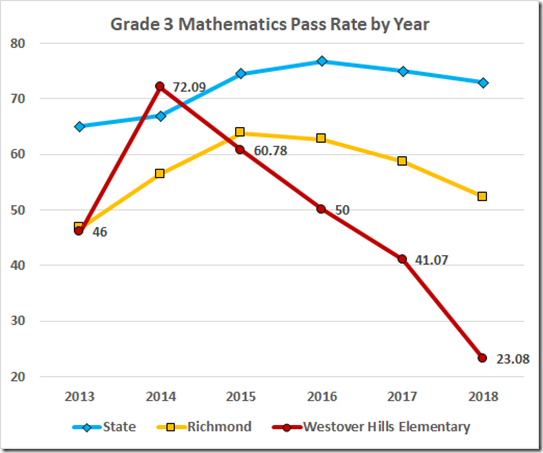 Either the third grade students in 2015 and 2016 were dumb as rocks (unlikely) or one or more good third grade teachers left in 2015, to be replaced by not so good teachers. 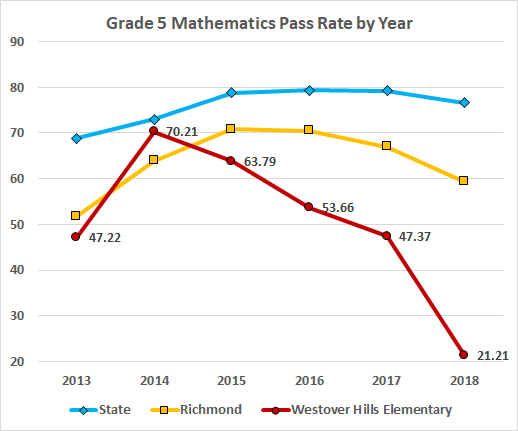 Somebody was doing a pretty good job with fourth grade math. 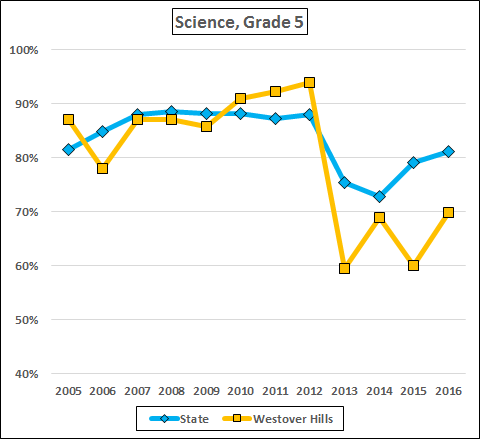 Something happened in fifth grade science that exaggerated the effect of the new tests in 2013 and then failed to produce a recovery. 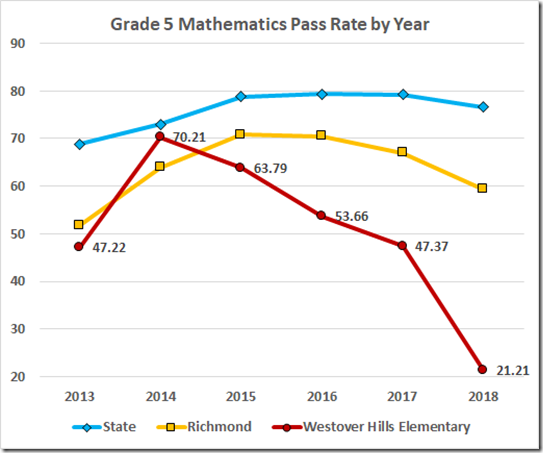 Loss of a good teacher in 2013? 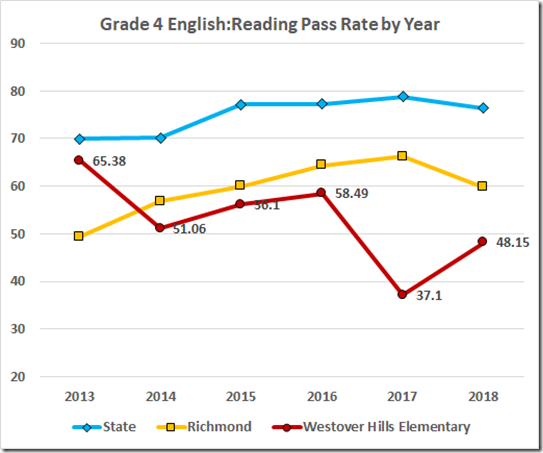 For sure, the current subpar pass rates are not acceptable. 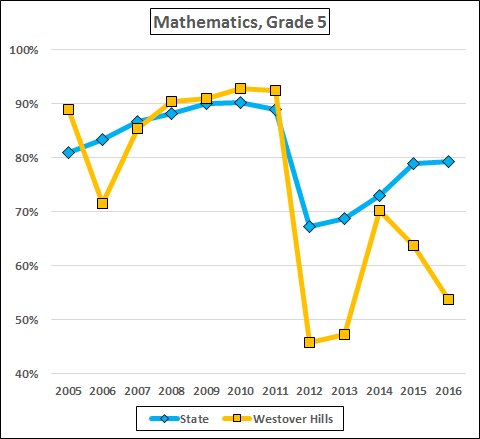 Someone with a more detailed knowledge of the personnel at Westover Hills should draw some more specific conclusions and then be prepared to demand effective personnel evaluations and accountability from the Principal and the School Board in the upcoming corrective action plan.